This past Friday we decided to try out some of the deals on tap for Boston’s Restaurant Week. We knew we needed to find Seafood (yes we are Catholic). Though my husband has frequented McCormick&Schmick’s for lunch we had not gone there for dinner. We even decided to have our two children tag along. We were happy to find that they had standard fare for children. My son picked the chicken fingers and my daughter the cheeseburger. They both were quite happy with their selections. My son who is a very finicky eater loved the chicken fingers. Though they are a seafood restaurant they do offer steak and chicken. My husband decided to pick the Steamed Maine Lobster from the Boston Restaurant Week Menu. We actually sneaked a picture of both our dinners so that you can see what we are talking about. 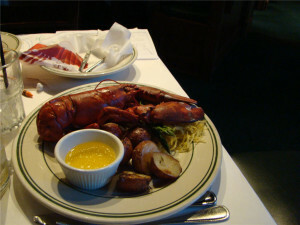 As you can see the lobster is a 1 pound lobster with veggies and roasted potatoes. My husband thought the taste was good but thought he should have gotten more. For lobster I think that is debatable since the meal includes a starter course of soup or salad and a third course dessert. For $33.10 I think that was not a small lobster. He chose the Caesar Salad and Chocolate Silk Pie for dessert. Both of which were very good. I chose the Lobster Ravioli which was topped off with Crab Meat, this variation is not on the Boston Restaurant Week Menu but was reasonably priced at $19.95. I had the same salad. 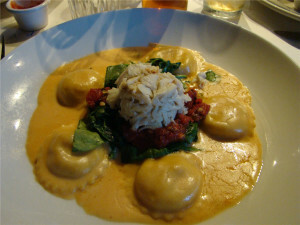 I have to say I really liked the Lobster Ravioli because of the tomato based sauce that was under the Crab Meat. Not that I didn’t like the rest but since I tend to try Lobster Ravioli whenever I have the chance and the sauce combined with the Crab Meat and Spinach made it just a bit tastier. Of course I wish the portion was bigger but that is because it was so good not because I think they were skimping on the dish. When it came to the portions I think the biggest portion was the dessert because they gave us a pretty big piece of the Chocolate Silk Pie. We were easily able to share it with the kids. 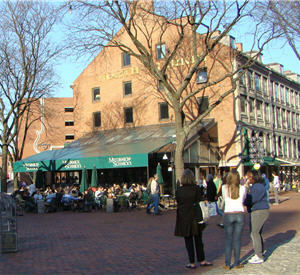 McCormick & Schmick’s in Faneuil Hall is frequented by both tourists and local visitors. People who work in the financial district find the abundance of restaurants in the Faneuil Hall area quite convenient. McCormick & Schmick’s has 80 restaurants across the country and can be considered a little pricey by some. Let’s face it though seafood is expensive in general. If you want to review their Boston Restaurant Week menu or any of the other restaurants participating in Boston Restaurant Week refer to our post on this March’s Restaurant Week. Don’t forget it ends this week on the 26th.